by Dr. Pamela Beach-Reber, M.D. While the American Academy of Pediatrics initially recommended against any screen time for children under the age of two, as the digital age has evolved, so too has its official stance on small children and screen time. 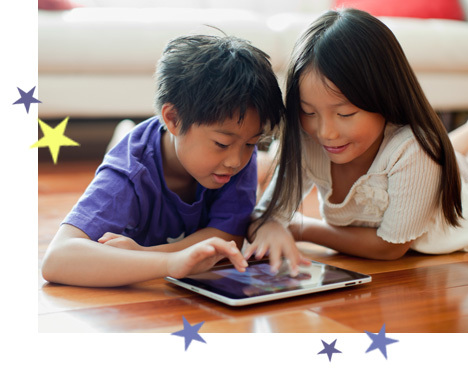 The AAP now believes that "in a world where children are 'growing up digital,' it's important to help them learn healthy concepts of digital use and citizenship." Quality digital content has the potential to lead small children into other worlds, stir their imagination, and inspire them because its dynamic display of moving colors, shapes, sounds and spoken language are well suited to their short attention spans and developing minds. The key word is "quality" however. Not all digital content is beneficial. To keep your child safe, the AAP suggests treating media as you would any other environment in your child's life by being involved, screening their content, and setting limits. Like any educational resource, media is most effective when used with an adult caregiver. One of the most important things for a child's healthy development is for their caregiver to hold them, hug them, talk to them and interact with them. Watching media together can be a tremendous interactive experience. Hold your child on your lap, or snuggle up next to them while you talk about the lessons you're both viewing together. Ask them questions about what they see, what they anticipate might come next, why they believe things happened. Of course, every parent needs a break now and again, and you can allow your child to watch without you sometimes. But you should *always* watch everything you play for your child at least once yourself. If the content is too terrible for you to sit through, chances are your child doesn't want to watch it either. If you find the presentation mind-numbing to sit through, then ask youself, "Is this the right program for my child?" The best children's programming is made with adult viewers in mind as well, to promote co-viewing and family bonding opportunities. Besides your own common sense, there are certain qualities you can be on the lookout for to determine if your child is benefiting from or being harmed by digital programming. Simply put, how does the video look overall? Does it look like the production company spent time and money on the presentation, or like something your brother-in-law shot in his basement? If you wouldn't stand for lousy homemade production quality and cheap computer animation effects in your own programs, your baby shouldn't have to either. Good quality educational videos look like good quality educational videos. If the production quality is outstanding, chances are the company spent just as much time in pre-production, working with educators and medical professionals, researching the subject and planning the best program possible. This sounds obvious, but many videos for children actually include unsafe content. Sure, a close-up of a candle onscreen is pretty, but do you want your baby lulled in real-life by fire? One popular baby video shows characters digging a bottomless hole and then jumping into it, forever disappearing. Not exactly what I'd want an adventurous two-year-old to see. Small children have short attention spans. Good educational programming tailors its presentation to that attention span in nonabrasive ways -- for example, with quicker editing and an interesting soundtrack. Programming that purposefully demands a small child's undivided attention with loud noises and frenetic movement is actually incredibly harmful. One popular series uses startling sound effects -- trash can lids dropping on concrete, balloons popping, tires screeching -- to make sure babies don't dare look away from the screen. These sounds are not only the unnerving equivalent of snapping in an infant's face, they actually act as Negative Reinforcement, conditioning children, like tiny Pavlov's dogs, to never look away from a screen for fear of punishment. No doctor or educator in the world would endorse this type of Operant Conditioning (and none has). Many baby videos use classical music and cite the "Mozart Effect" as proof of their educational worth. However, all classical music is not created equally. The merits of the Mozart Effect exist because of the mathematical qualities and varying complications in the movements of fully scored orchestral music. Classical music "re-engineered" through a computer can remove 90% of the instruments, variations and musical richness, and end up sounding like a tinny music box. Music boxes are fine, but educationally stimulating baroque music, they are not. Used appropriately with the right content, media can enrich the life of viewers of any age. Just make sure the exposure is age-appropriate, guided by you, and most importantly, part of a loving learning environment you've created in your home. 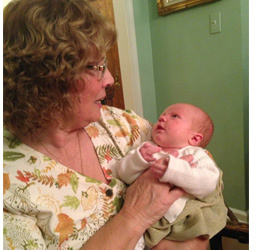 Dr. Pamela Beach-Reber, M.D., pictured left with one of her grandchildren, is one of the country's leading pediatrician/neonatologists. Mother of five and grandmother to 18, she's triple-board certified in neonatal-perinatal medicine, pediatric emergency medicine and pediatrics, and holds a Masters of Business Administration (MBA). She currently practices in Orlando, Florida.